News - Meat and poultry wrap and salad products recalled due to potential Listeria contamination - Got Food Poisoning? Report it now. Approximately 3,329 pounds of ready-to-eat meat and poultry wrap and salad products were recalled by Great American Marketing, Inc. in Texas because it may be contaminated with Listeria monocytogenes, according to the recall notice published by the U.S. Department of Agriculture’s Food Safety and Inspection Service (FSIS). Consumers who have purchased these products are urged not to consume them. These products should be thrown away or returned to the place of purchase. The ready-to-eat products were produced on various dates from March 27, 2019 through April 8, 2019. The products subject to recall bear establishment number “EST. 31680” or “P-31680” on the back of the product package. These items were shipped to retail locations in Texas. Consumers should call (713) 682-6471 with questions. 9.25-oz. 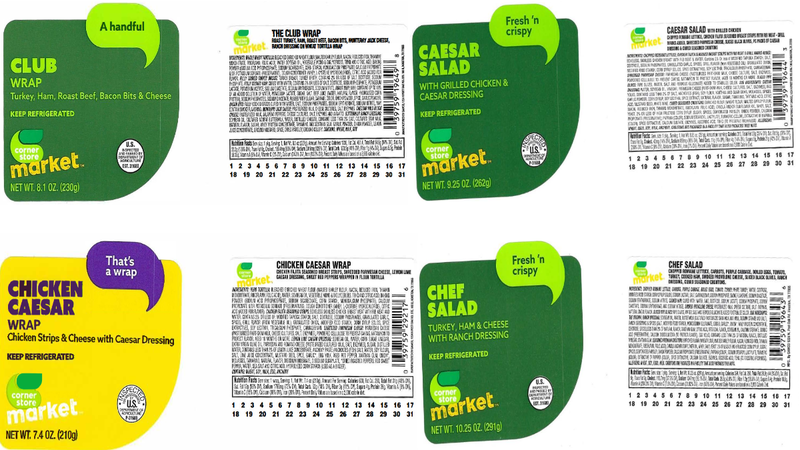 plastic sealed cartons containing “corner store market CAESAR SALAD WITH GRILLED CHICKEN & CAESAR DRESSING” with sell-by dates of 04/09/19 through 04/15/19. 10.25-oz. plastic sealed cartons containing “corner store market CHEF SALAD TURKEY, HAM & CHEESE, WITH RANCH DRESSING” with sell-by dates of 04/09/19 through 04/15/19. 8.1-oz. plastic sealed cartons containing “corner store market CLUB WRAP Turkey, Ham, Roast Beef, Bacon Bits & Cheese” with sell-by dates of 04/08/18 through 4/20/19. You can check the full recall notice here on the FSIS website.